I have had time to think on things that 2013 has made me question. As we close out this year, enter a new one, and hope that we can both discover great films like The Spectacular Now and avoid such things as After Earth, it's a time for reflection. Every year there will be beauties and duds. It took a while before I got a great film, and another while before encountering a disaster. Still, these are not questions about movies themselves. Instead, let us think on other movie-related matters. Only God Forgives is a flop, both artistically and commercially. It is especially an artistic flop because it tries so unbearably hard to be 'artistic', to be 'deep', and it only comes off looking idiotic. Given that, have we all been wrong about Ryan Gosling? Have we mistaken his good looks and avant-garde persona for genuine acting talent? I don't think so. Gosling has worked hard to achieve success (and I don't hold his tenure in The Mickey Mouse Club against him, though sometimes I think he tries too hard to break away from his roots). In 2013, Gosling had not one but TWO flops (Gangster Squad and Only God Forgives). Does this mean the public won't rush to a Gosling film like they would say...a Channing Tatum film? Again, I can't say that's the case. Gangster Squad wasn't a hit due to outside factors (the Aurora shooting making a dramatic moment in Gangster Squad, a shooting inside the Graumann's Chinese Theater, unviewable and requiring a major script change). However, Gangster Squad also wasn't very good, and he wasn't very good in it. Your beautiful blue eyes can carry you only so far. Only God Forgives, however, was just a frightful mess, and his no-note performance (17 lines in total, I understand) is Gosling at his most self-indulgent (pseudo-artistic, humorless, mistaking moroseness with being mysterious). I'd recommend a comedy for Gosling, but even the comedies he's been in (Crazy Stupid Love) there was a remoteness, an aloofness to him. This runs the risk of making Ryan Gosling so distant from us that audiences will see in him a great actor but not someone to go see. My advice, my dear Canadian, is to let your hair down. Work at an actual comedy where you get to be made the brunt of jokes, even get a pie thrown in your face. Lighten up, and avoid 'artsy' films like Only God Forgives. In short, stop trying so hard to be 'avant-garde' (hence my habit of always calling him 'avant-garde actor Ryan Gosling). Is Will Smith's career over? After Earth is the Worst Film of 2013 (though in fairness, The Big Wedding gave it a wild run for its money). It was terrible because it took away the one thing Will Smith has always been: likeable. His attempt to be 'serious' only ended up being 'sour' and 'remote', so much so that audiences who have almost always been good to Smith abandoned him and were generally displeased en masse. Let's remember that The Fresh Prince wasn't seen as an 'actor' like a Denzel Washington or Sydney Poitier, his role models. He was just a pleasant rapper who starred in a friendly family sitcom. Over time though, Smith took chances regardless of its commercial viability. There was the little-seen Six Degrees of Separation, which wowed critics and showed his ambitions to be an actual actor and not just a star (there is a difference; just ask Channing Tatum--a star, not an actor). He also jumped at the chance to be in big films but where he was part of an ensemble (Independence Day). In short, he worked at his craft, jumping from big budget popcorn films like Bad Boys to more intelligent and emotional fare like The Pursuit of Happyness. End results? Two Oscar nominations (The Pursuit of Happyness and Ali) and being one of the few actors/stars to appeal to all America, someone who is beloved by audiences of all ages, sexes, and races. Sure, he made mistakes (Wild Wild West), but on the whole things were going well in his career. However, sometimes even bright and talented people like Will Smith go a bridge too far. Seven Pounds is the turning point I think. This dour, excessively somber and convoluted film could not get by on Smith's talent or charms, and it was the first major flop in his career commercially and critically (let's remember Wild Wild West was a hit...somehow). It took four years for him to appear in another film after Seven Pounds threw him for a loop, and that was in what should have been a sure-fire hit: Men in Black III. It wasn't a big hit, and the one after that was...After Earth. It's interesting that Smith pere is the best example of someone for whom hard work has reaped great rewards, which makes his decision to pave the way for Smith fils to become a star by fiat all the more puzzling. Will Smith worked for everything he's gotten. His son Jaden has had everything handed to him on a golden platter. Jaden was wonderful in The Pursuit of Happyness, but after that he's proven he either does not have the talent or desire to be an actor (though the star bit, perhaps). Jaden was unbearable in The Day the Earth Stood Still, showing no range whatsoever. That didn't stop Daddy and Mommy Smith from creating a whole vehicle for their dear one in another remake, The Karate Kid. Again, he was lousy in that film. Then, to ensure Jaden would be turned into some sort of action star against America's will, came After Earth. Jaden has never had to work to get into films or recordings, like his father did. I don't blame any parent for wanting to do right by their children, but if Jaden truly wants to be an actor, it would help if the Smith parents simply got out of the way (and some lessons). Jaden never looks like he's having any fun onscreen, and frankly, we the people are not having any fun watching him onscreen. It's hard to empathize with someone old enough to be my son who makes more money than I do and fail spectacularly at what he's making millions for again and again. However, if Will Smith a.) continues to push Jaden and his daughter Willow at us and b.) continues to make that the focus of his career, the Smith family will find diminishing returns. Has Johnny Depp's schtick worn out its welcome? Johnny Depp has earned a reputation of being a great actor, and I for one don't argue that. He has gone long past his 21 Jump Street days (though not averse to poking a little fun at his beginnings) but frankly, this 'Captain Jack' persona has become tiresome. Being self-consciously weird can only get you so far. The last good performance Depp has given was in Finding Neverland, and I think it has to do precisely because it was radically different from his 'Captain Jack' style. His J.M. Barrie was gentle, kind, and the Scottish accent worked (a rarity in film). Now, don't get me wrong: I think his performance in Curse of the Black Pearl was wonderful again because it was so gleefully and knowingly outlandish. However, since then Depp has been coasting on his 'aren't I really weird' self-conscious style that it is difficult to really distinguish one performance from another. Is there really that much difference between Captain Jack Sparrow and Willy Wonka, or the Mad Hatter, or Barnabas Collins, or Tonto, or even Sweeney Todd? Depp has gone too far in the deep on the 'weird/wacky' roles, and the few times he hasn't been as deliberately nutty (almost hammy), like in The Tourist or The Rum Diary (though I'd argue there was still some of that 'Captain Jack' method to his madness in those) he looked as if really didn't want to be there. Good news...neither did audiences (especially The Tourist). Depp really has been playing variations on the same character for now a decade (with an occasional break), and it's really time for him to stop and begin to actually 'act' again. 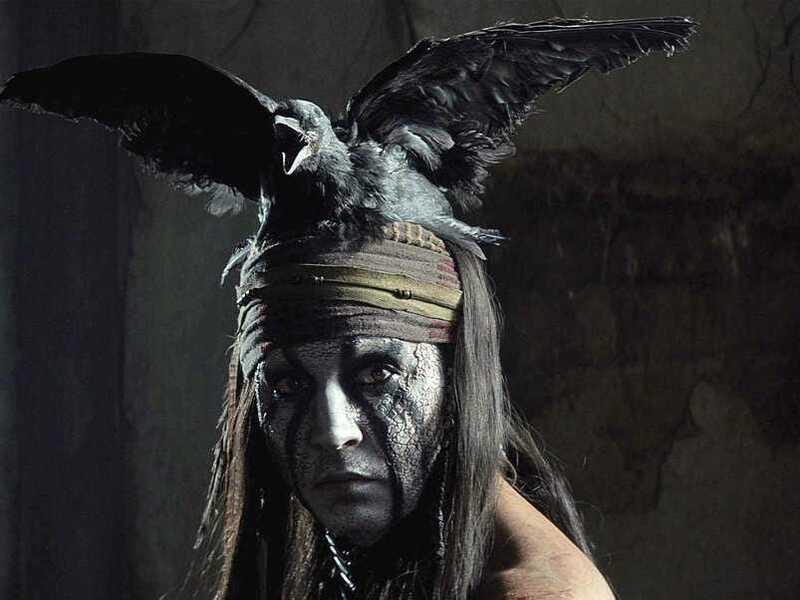 It's time for Johnny Depp to find a director and script to truly challenge him, to push him into abandoning all those quirks and mannerisms he's brought from Curse of the Black Pearl that found their nadir in The Lone Ranger (though yet another Pirates of the Caribbean movie shows he is perhaps not as rich as we think and needs money). Depp needs to retire his collaboration with Tim Burton, who lets him get his way far too often and whose relationship has become toxic artistically. They made a great team, but now they are crutches to each other. How many more bombs can Ryan Reynolds make? Ryan Reynolds CAN act (example, Buried). I also tend to have warm memories of Reynolds ever since he was in Two Guys, A Girl, and A Pizza Place. Yes, it was a Friends knock-off but confound it, I liked it. I liked him in it too as the smart-aleck Berg. That, however, may be the problem. Just like Johnny Depp has been playing the same character (or variations thereof) for around ten years, Reynolds has, with a few exceptions, been playing the same character for more than fifteen years (when Two Guys and a Girl, as it was rechristened, premiered). This is pretty much the Van Wilder persona, cocky, with a quick quip and smooth charm mixed with high sarcasm. I think perhaps there's been too great an emphasis into again, pushing someone as a 'star' instead of an actor and using his looks more than his abilities to promote a product. Ever since his turn as Deadpool in X-Men Origins: Wolverine (where he was Van Wilder In Mutant Form), Reynolds, with few exceptions (see Buried) has not strayed past this persona. What makes this even worse is that the genre doesn't matter. It can be romantic comedy (The Change-Up), it can be action (Safe House, about the only bad Denzel Washington film I can think of), it can be comic book films (where X-Men Origins was a preview of coming distractions). As much as I like Reynolds from Two Guys... I shall always have a special dislike for ruining my favorite comic book hero in Green Lantern. I am simply so glad that my friend Fidel Gomez, Jr. (who may or may not be dead) was not around to watch it with me. Given Fidel's general disdain for Green Lantern altogether (The Magical Ring, he always mocked), if he had been with me when I saw it with my brother Gabe I'm sure I never would have lived down the shame and horror of it all. Fidel would have had a major weapon against me (as if Sky Captain and the World of Tomorrow, a film I was pumped for until we saw it, wasn't weapon enough). Still, 2013 is yet another black mark in Reynold's career. While he did well with The Croods, two other vehicles (Turbo and R.I.P.D.) failed, the first one unfairly in my view. It wasn't the greatest film I saw, but it was cute enough. R.I.P.D., on the other hand, really is dreadful, and he was dreadful in it. That's the SECOND comic book-based film that he has destroyed. Yes, it wasn't all his fault, but he did contribute to it. I think Ryan Reynolds should work at an ensemble film where he isn't asked to be snarky. The guy has talent. It's just that this mad desire to push him into being a 'star' is failing, and if he continues to be in projects that push him into being a commodity and less a performer, he may end being a guy AT a pizza place. Let us hope that 2014 give us more Spectacular Nows and less After Earths. I know it will have terrible films. I'm just hoping there will be fewer of them. With that, I wish you all a most blessed New Year.